In his debut work of fiction, Daniel Tam-Claiborne chronicles the experience of living and working as an English teacher in the rural Chinese town of Taigu. In a collection of twenty-two short stories organized around the theme of culture shock, he intersperses the narrative with scenes from his journeys further afield, while constantly questioning his own identity as a Chinese American. 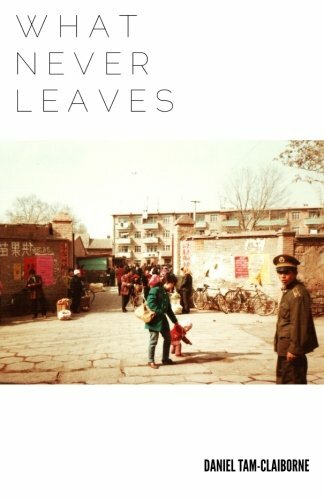 What Never Leaves is a fascinating and often startling look into China’s modern culture and the ceaseless search for understanding in a foreign land. With humor, poise, and curiosity, Tam-Claiborne weaves an intricate portrait of a young man struggling through what it means to travel and what makes us human. "This is a fabulous collection of vignettes that weave together themes of travel, culture and identity, centering around two years of living and teaching abroad in rural China." "The book really puts you in the moment, and it does so with honesty. If you want to know what it really feels like to live and work in rural China as a young American in the early 21st century, this book will take you there." "There are a bunch of funny moments in the book, and I hope that they're universally funny, but they were especially funny to me, as someone who has also spent a lot of time in Asia, especially China. I especially recommend this book to people who have wrestled with the idea of being Asian American." "If you are a neurotic that has ever lived abroad you will probably find yourself relating to the main character." "Having never traveled to Asia before, this book painted a really interesting image of what living as an expat in that environment must have been like." "A wonderful book for anyone who goes abroad at any time, the author really gives a sense of what it feels like to be an American in a foreign country and all the feelings and emotions that come with it." "This book is a great read for travelers, those with a streak of adventure, Chinese culture enthusiasts, and book lovers alike." "This book should be required reading for Fellows to Taigu!"